Icicle lights are one of the more recent trends in the category of Christmas lighting. Evoking the wintry cascade of icicles, these holiday lights have been widely used all around the country. When planning your Christmas decorating you’ll want to include plenty of icicle lights. A few simple considerations will help your Christmas lighting project go smoothly. Before you begin hanging your lights, formulate a plan. 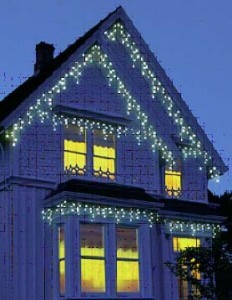 Icicle lights are especially conducive to use along the roof line where they simulate the effect of winter’s own icicles. Other good uses for icicle lights are placing across the tops of windows or affixing them to the branches of trees–all places where Mother Nature herself would place her own icicles. Resist the temptation to place icicle lights in places where they would never accumulate naturally. Doing so just looks silly. When shopping for holiday lights be sure to look for the UL (Under Writer’s Laboratory) rating. This is a fairly good indicator that the lights have been manufactured according to safety standards that will not pose a hazard for you or your home. When selecting lights for your Christmas decorating project be sure to purchase the right type of lights for the job. Use indoor lights indoors and outdoor lights for outdoor applications. Using holiday lights in the incorrect application can pose a danger and adversely affect the longevity of your Christmas decorations. Outdoor lights are designed to stand up to harsh outdoor weather conditions, while some lights are designed specifically for indoor use such as on trees. A final suggestion is to consider a timer for managing your display of Christmas lighting. Timers allow you to program the hours you wish your display to be actively lit and save you the hassle of turning lights on and off. Timers are available for both indoor and outdoor applications, so choose the one that best meets the requirements of your Christmas decorating display.